Dragon Ball Culture Volume 5 Available! Dragon Ball Culture Volume 5 is now available in ebook! Son Goku battles the demon king! Did you know that Bulma had a name before it was Bulma? 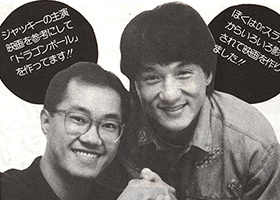 Akira Toriyama loves Jackie Chan movies, but did you know that the two of them once met each other in Japan? All 5 episodes of Dragon Ball Runaways are now available online. The new Dragon Ball Z: Saiyan Saga preview trailer has premiered! The Dragon Ball Z: The Fall of Men live-action fan film has arrived! Youmacon 2015 – Thank You! Thank you to everyone who came to visit me at Youmacon 2015! You made the convention so memorable! Dragon Ball Runaways returns on November 25 with a 4-part live-action web series!